Able Engineering use sheet metal specific CAD/CAM programming systems ( Amada DR ABE) with electronic import and unfold capabilities ( Solidworks). We are able to receive your data files in many different formats (dwg, dxf, prt, sldprt, etc.). All our shop's floor is networked to our engineering computers. This guarantees precise and expedient data transfer. 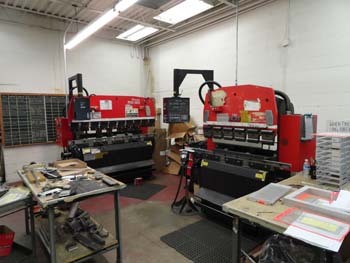 Our manufacturing shop is organized in a way that your parts are made to the correct revision every time. 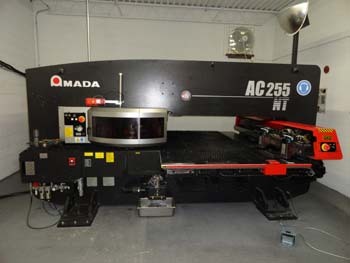 We have the latest Amada equipment for punching and forming operations. Our AC255 NT punch press series machine give us the opportunity to affordably take advantage of the many newer processing capabilities available in punching — along with the additional benefits of a machine that is both environmentally-friendly and costs significantly less to operate and maintain than some older technologies.